Designed to meet your most challenging water treatment needs. Designed specifically for commercial and industrial applications, the EXCEL® AD chemical metering pump gives you improved electro-magnetics to meet your specific flow and pressure requirements, up to 250 psi (17.2 Bar) with capacities between .002 and 2.0 GPH (.8 to 7.6 l/h). The EXCEL AD pump provides industry solutions for more versatile chemical injection with up to 1000:1 turn-down capacity to take control of your application. This line includes an advanced design fitting system for secure, leak-proof tubing or NPT connections. Every pump comes standard with FASTPRIME™ liquid ends. If pumping off-gassing liquids, select the (optional) AUTOPRIME™ liquid end. High-viscosity liquid ends (optional) are also available for pumping high viscosity liquids. 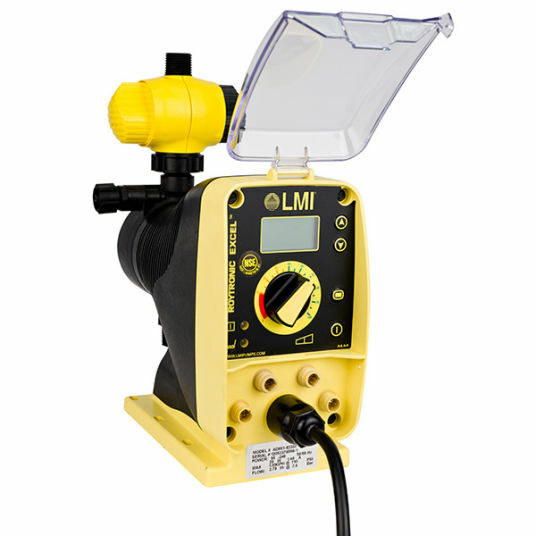 With an easy-to-read LCD user interface, external pacing, alarms and pulse/4-20 mA input and output capability – the EXCEL® AD pump has the power and flexibility you need to accurately perform in the harshest industrial or municipal environments.